Simon Snow just wants to relax and savor his last year at the Watford School of Magicks, but no one will let him. His girlfriend broke up with him, his best friend is a pest, and his mentor keeps trying to hide him away in the mountains where maybe he'll be safe. Simon can't even enjoy the fact that his roommate and longtime nemesis is missing, because he can't stop worrying about the evil git. Plus there are ghosts. And vampires. And actual evil things trying to shut Simon down. When you're the most powerful magician the world has ever known, you never get to relax and savor anything. 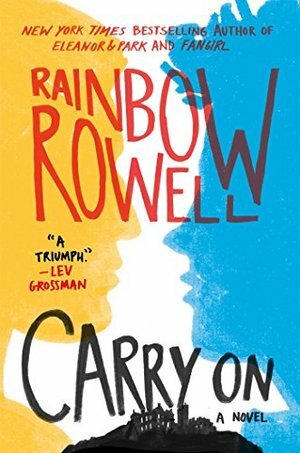 Carry On is a ghost story, a love story, a mystery and a melodrama. It has just as much kissing and talking as you'd expect from a Rainbow Rowell story--but far, far more monsters. If you've read my book Fangirl, you know that Simon Snow began as a fictional character in that novel. A fictional-fictional character. Kind of an amalgam and descendant of a hundred other fictional Chosen Ones. In Fangirl, Simon is the hero of a series of children's adventure novels written by Gemma T. Leslie--and the subject of much fanfiction written by the main character, Cath. But I couldn't let go of Simon. Review to come, and to include a likely very boring explanation of why I even read this in the first place. *Typing out that quote really brought out my editing demon. Ms. Rowell would benefit greatly from finding even meaner editing demons. Demons who would teach her that paragraphs can have more than two sentences, and should almost always have more than one sentence. Also that ellipses are not colons. It is really rare for me to get annoyed with the physical structure of writing; I am not a grammar police type reader (and I am well aware of my ability to find typos in my own reviews no matter how many times I re-read them before posting). But there it is, for whatever benefit it brings the world. THIS IS MY ALL TIME FAVORITE NOVEL! it is amazing and packed with twists and turns and so many feelings.